This Lughnasadh season’s harvest has made me very happy. I garden in containers on my patio because I rent. I don’t have enough room or resources at this time to grow all the food my family eats, but I’m always proud of contributing to our stores. Every year comes with successes, failures, and the resulting lessons. 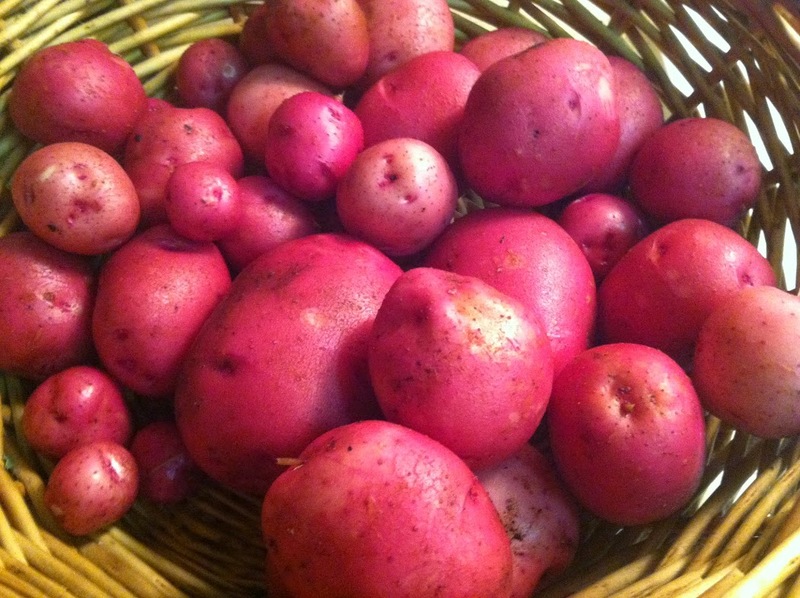 Red potatoes from my garden. Photo by Grey Catsidhe, 2014. This year I decided to try growing potatoes in containers. I had never done this before but did some research beforehand to know it was possible. I also decided to throw my remaining container-variety carrot seeds in with some tomatoes. I didn’t have luck with them last year (possibly due to the sun they were getting), but I figured it was worth a try again under different conditions. Last year, they were grown in a pot on their own. This year I decided to try some companion planting. 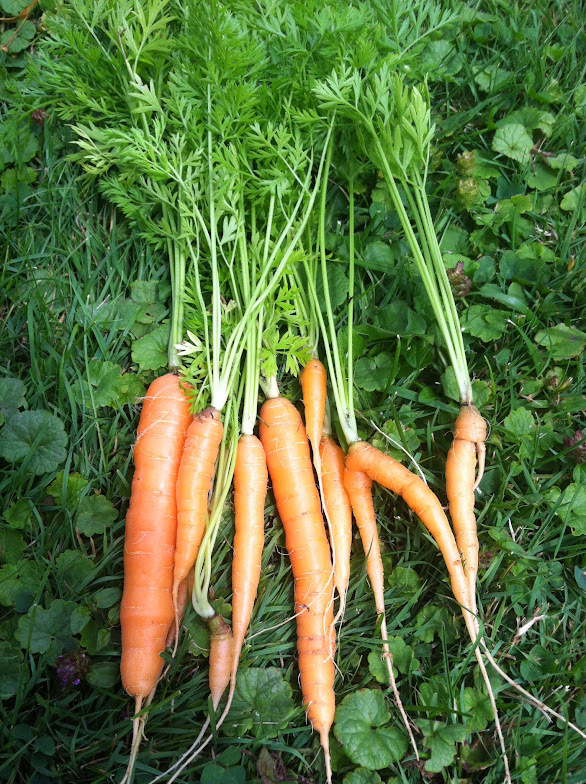 My carrot harvest. Photo by Grey Catsidhe, 2014. The results of both have been amazingly successful given the amount I planted and the size of my operation. There is always room for improvement, and this season has brought me more lessons and things I want to try, but I really must thank the Nature Spirits and Earth Mother for such a splendid harvest! One lesson (which was really something I already knew but it was made more vivid) has been just how creative and destructive growing root veggies are. Without going on too much of a tangent, all magic (despite what some may say) in simultaneously creative and destructive. Since creation relies on the the destruction and reorganization of something else, you simply cannot get something for nothing. It is why I reject notions of “white and black magic.” I also understand that gardening means the destruction of other places – habitats, mostly. There are definitely less intrusive methods of gardening, and I strive to learn and embrace them as I grow in my practice, but no matter what, even obtaining only plant-based foods, I am causing the destruction and death of others – including animals. This is why, in my perspective, we need to approach our meals, whatever they are comprised of, with an extreme amount of humility, respect, and generosity. Eating, to me, is a spiritual experience. In striving to eat locally grown and seasonal foods, I am communing with nature in a very intimate way. I take it into me, become one with nature, affirm my place as a Nature Spirit and child of Earth. Each time we eat, we take in some of the energy that has been recycled for countless generations. It is why I still pray before a meal. Anyway, the disruption we cause in our eating was made painfully obvious to me as I harvested my potatoes. There are two ways to go about this – you either reach into the containers and dig around, or you dump them. Either way, a whole mini eco-system is disrupted. I went with the former simply because my containers were so large and heavy. As I unearthed each pink orb, roots tore. Small creatures ran – centipedes wriggled away and earthworms tumbled out of dirt clumps before spearheading back into the soil. At one point, a large mother wolf spider with babies on her back rolled out of a potato plant’s roots as I yanked upwards. Some soil fell on her and I noticed that some of her babies vanished. I moved her as best I could, but I fear some little ones may have been killed or separated by accident. It broke my heart, and I’m still hoping she was reunited with them. Even if you’re a vegetarian like me, it is impossible to live in such a way where you do absolutely no harm. All any of us can do is to make the choices we feel are best for ourselves and those we share the world with, continue to learn, and try to live in better harmony with the world. That will mean different things to different people, but it will help us all approach our meals and each other with deeper respect and love. It’s amazing what some potatoes and carrots can teach you. Such simple experiences that teach such deep & insightful lessons! When we, or the majority of us, buy things from the store, we wouldn’t even think twice about the way our food was raised or processed. We take it all for granted, have lost knowledge & wisdom, and miss out on so many lessons… It’s sad that some of us, myself included, are struggling to learn such simple skills that our grandparents took for granted & came natural in order to live (i.e. growing gardens, canning & preserving, sewing, etc.). We’ve gained a lot of knowledge with improvements in technology, but have lost so much too. I agree! I’m trying to learn and retain many traditional skills, but there’s only so much I can do at once… I’m sure there are more lessons for me in canning, foraging, and herbalism – skills I would like to perfect as I grow! You are blessed with a good harvest 🙂 In nature death is the shadow of life. I never looked at it this way. Thanks for pointing it out!